If you enjoy learning fun and innovative ways to reuse household items, you will love the following hints. Earlier we posted 30 Ways To Reuse Bottles And Containers and How to Decorate Your Home with Used Furniture. You can put your imagination and creativity to work in various other ways than those as well! This article is a compilation of many such ideas that came to my mind while writing this post. There is no need to struggle to find your perfect way of reuse and re-purpose. You can pretty much reuse every household item. Leave your ongoing efforts to recycle and get to reuse things around your home in a smart way. You will even have fun through the entire process. First, you might want to find out why it is important to reuse. Determine your priorities and get prepared to cut costs. Not only reuse cuts cost, it does create opportunities to make extra money. I have a wonderful example of reuse and repurpose becoming a full-time hobby and slowly forming into a business – My father’s example! My father is a good craftsman, although he made steel from iron throughout his life, he never quit making handicrafts and decorative items out of the things we use every day. He now has an online business. My father’s successful Etsy store sells handmade table mats and wall decors if you like you can order them through Etsy. These are fine pieces of craftsmanship from clothes we discard (for his business orders, my father uses new clothes though), a dying Indian art. The key point to immense savings is to proceed with many things simultaneously. Plus, you need to stick to it. All in all, these savings will start to add up. 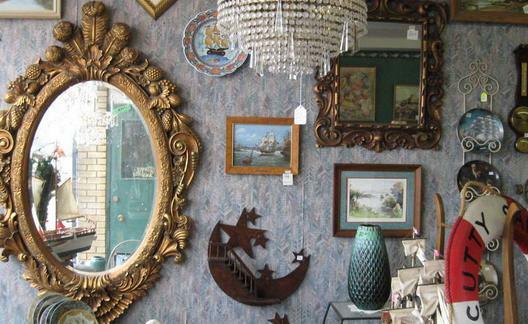 Transforming your things can be a challenge, but you can create home decorative items with damaged frames. Every family throws out a huge trash bag weekly; imagine if we multiply this amount considering every household. Reduce your trash, repurpose and reuse household items and achieve big savings. I encourage you to see the idea here and if you like one particular idea, you can see the related YouTube videos for the nitty gritty. You must be able to find various ways tor euse household items here. If we waste one thing most, that would be food. Be it fruit and vegetable skin, seeds or the cooked meals. Here’s how you can reuse the food waste to make compost. The other things we all trash is the old Christmas tree. This can be kept outside and made a big birds nest while allowing it to decay naturally. If you don’t need your old clothes anymore, somebody might donate them to charities, Goodwill or Salvation Army are just a phone call away. You can reduce plastic waste by reusing grocery bags. Read these 50 ideas and get inspired. 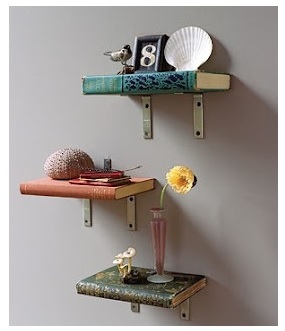 There are gazillion ways to reuse old furniture. Reuse Coffee grounds and tea leaves for gardening. Here are other ways to reuse them. Get water/milk gallons and use them to water your plants. Get a basket or a milk jug and use it to wash dishes or to wash your clothes. Cupcake tray can be reused as a jewelry organizer. Use towel rolls to organize your home wires. Get yogurt cans and use them for leftovers. Small sour cream containers can be used for lunch or leftovers, too. Old ketchup bottles can be reused to make pancakes or flannel cakes. One most effective way to reuse household item is to use the plastic shopping bags as your trash disposal bags. For us they come handy as we need to dispose 5-8 dirty diapers a day. Wine corks are great to hang posts its. Hang pictures with wine corks, too. Dryer sheets. You can freshen up any room. Tissue boxes are good as trash receptacles. Cereal boxes to fit your jewelry. Old blankets are great for dog houses. Plastic containers are fabulous to fit your earrings. Reuse oven heat in chilly nights. Coffee grinds instead of cellulite gels. Lemon and sugar as a scrubbing cream. Dish soap bottles, for at home emollients. Bottles to fill your iron. Egg cartons to create a fancy decorative item. Styrofoam cartons for cookie dough and/or butter patties. Egg cartons for garden seedlings. Shoe boxes to organize change. Old floor tiles to create a fabulous mosaic art piece. Unused remnant tiles for a decoration project. Floor-tiles to develop a fancy tabletop. Old socks for small toys. Tiny plastic bags to keep paper clips. Paper towel rolls for extension cords. T-shirts with holes for homemade pillows. Damaged clothes as wrap breakables. Towel rolls for hair bands. Wine glasses can be reused as pots for the cactus plants. Milk jugs as clothespin holders. Plastic soda as children piggy banks. Here’s how to do it. Water bottles for decorative purposes, painting jobs, etc. Spaghetti jars as small planters. Beer caps to create tiny magnets. Bottle caps for custom refrigerator items. Glass bottles to create light bulbs fixtures. Bottles as decorative grass holders. Courier delivery boxes as file boxes. Shoe boxes as storage containers. Sunday comics as wrapping paper. And, if you have some unwanted wrapping papers already, here are 30 ways to reuse them. Damaged and old garden hose to make a soaker hose. Baby jars to create candle holders. Mailing tubes to develop a wine rack. Wine corks as fire-starters. Few others use of wine cork is here. DVDs or CDs covered with paper as drink coasters. Altoids tins as emergency kits. Small tins for sewing items. Shredded papers as packaging material. Old papers for shipping and delivery gift boxes. Foam as good moving material for packing. Old jeans to create pot holders. Tires to create a low table base. Old shoe rubber used for flooring purposes. Shower curtains to cover your AC during cold times. Bath mats as a brand new mop. Old fused light bulbs can be reused in 10 different ways. Used paper. Use both sides and create notepads. Replace disposable batteries with rechargeable ones. Use toner cartridges to create little toys. Improve your old sofa with a new cloth. Reuse your used envelopes smartly. You can try starting an envelop budgeting system with them. Opt for reusable air conditioner filters. But, don’t forget to clean it regularly. Bags as wastepaper baskets or, laundry bags. Paper sacks attached to your kid mattress, this is great to dispose of cleaning tissues. Blackboard chalks to achieve a shiny metal look. Tiles as candle holders. Go through this Google images page for that perfect idea. Allow candle wax to drip over wine bottles. Here’s how you can do it. Wine bottles for rolling pins. Jewelry stand from soda bottles. Buttons as attractive earrings. In fact, there can be numerous good use of old buttons. This article compiles all such great ideas. Calendar pictures for fancy scenic decor. Old picture frames as a serving tray. Learn from Martha Stewart in this video. Small cans to prevent ants from climbing tables. Place them below the legs and pour some water into them. Carpet scraps as wall carpeting and/or tote bags. Cartons for makeshift tables or temporary storage. Containers to create children toys. Old razor blades for outline cutting and sewing jobs. They also remove hardened paint on windowpanes. 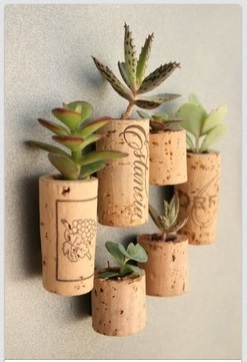 Reuse wine bottle corks as perfect pots for your wall cactus (check the image above). Here are 5 other ways to reuse wine corks. As you can tell, there are many ways to reuse household stuff. Get started and enjoy infinite savings.You may feel that doing things like reusing toilet paper rolls or milk bottles are signs of a miser. But mostly see them as your bit to help preserve the nature. The less amount you buy, the less you waste and the less pollution, especially the plastic items. Also, most of these ideas are fun to implement, you may start one of the ideas on a weekend morning along with your kids. This can become a powerful lesson for them towards frugality and protect the environment. There is no limit, if you think today, you may come up with 1001 more such ideas. You may enjoy just browsing through and getting inspired by this Pinterest section for innovative reuse ideas. Let this article be your guide and inspiration towards doing something new with your stuff. All the best in your quest of re-using and re-purposing. Don’t forget to share your story below. Incredible stuff! Thanks so much for this. The old book bookshelves are amazing. Such creative ideas. Love those wine cork cacti. Not very creative, but we reuse our plastic bags for doggy waste disposal. In general we try to use recyclable bags for our groceries, but we always take plastic bags from friends and family if they are just going to throw them away. Love these frugal ideas you shared. With so many people struggling just to have a little penny, we are fortunate enough to be living comfortably. We should not abuse what we have and think of the situation who hardly have anything. Wow! What great ideas! Thanks for sharing! Wow! 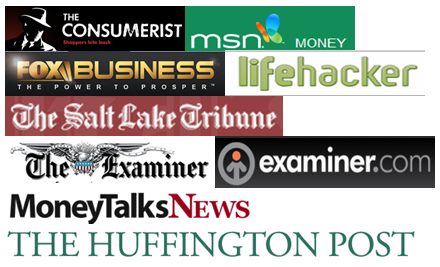 I am on information overload…in a good way! So much good stuff here! LOVE the book-shelves. 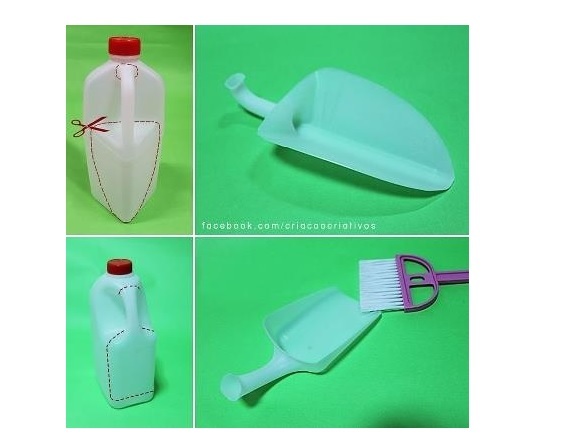 And the milk jug dust pan is genius! Jennifer, have you visited Kuttlefish? Many many more ideas there… and sustainable shopping. That is so cool I love the shovel idea a lot. So effective in cultivating the sand. These are great and awesome was that we can save money. Definitely, more we reuse more money we can save. Thanks for your comment! As long as you’re really reusing things and not using possible future uses as an excuse to hoard or keep clutter, this is great! Lots of creative ideas here. Very great and creative ways. I’m really impressed with those creations. Thanks. This is a great list, and thank you for including a link to my drip candle page! This is the ultimate list of recycling and reusing ideas! I’m definitely showing it to my sister, she’ll be very glad to find new projects here. Thank you for all these great suggestions! Greets! What a great list of useful enlightenment. You know, household stuff can really be recycled and reuse. I usually recycle and reuse candle wax. It was fun in deed. I also laid my hands on few recycling too such as plastics. Thank you again.